I am grateful to James Tabor for his grace and good humour in first listening to my questions and then accepting my suggested correction over the identity of one of the ossuaries in the Talpiot Tomb B investigation. Here are the details. On Monday, I gathered together some of my questions about Anomalies in the Talpiot Tomb B Photographs. 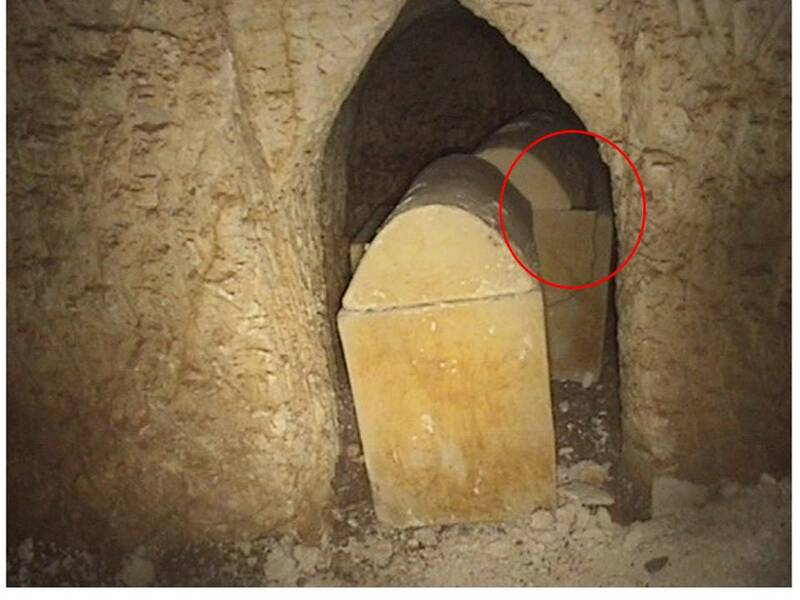 Some of my questions related to apparent anomalies between the pictures taken in 1981 when Amos Kloner briefly had the chance to investigate the tomb, and the more recent pictures taken with the robotic arm. My key question, though, related to an anomaly among the recent pictures. "Inside ossuary 5, kokh 3", Tabor, Preliminary Report, p. 32, fig. 7. Note the domed lid. Tabor, Preliminary Report, p. 37, fig. 15, "View of the snake camera and its light approaching kokh 3". Note that Ossuary 5, in the foreground, has a flat lid. 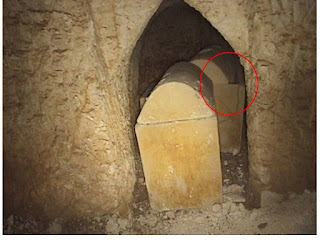 In comments to that post and in email correspondence, James Tabor has accepted that the supposed picture of ossuary 5 (in figure 7 of his Preliminary Report) is misidentified (also mentioned in James Tabor's blog, penultimate paragraph). Ossuary 4, kokh 2, taken from Complete Findings slide, labelled "4. Plain (Not fully explored) (Ossuary in the back)". I have added the red highlight to show where I think the camera could have gone in. A commenter Ian also suggested that Ossuary 4 was a candidate for the shot. And it now seems that this is correct. While accepting that the internal picture above could not be Ossuary 5, Prof. Tabor then suggested that it might be Ossuary 2. I pressed the point that Ossuary 4 here was a better candidate and Prof. Tabor subsequently agreed and noted that he had received confirmation of this from the GE camera guy (via email to me only). Update (Friday): James Tabor has now updated his article, Preliminary Report, though I must admit to a little disappointment that he did not acknowledge the source of the correction. Update (Saturday): Photographs and captions added to the above post to make it easier for people to follow the discussion. Many thanks for your sharp eyes on this Mark. I had wrongly assumed, not noticing the "lid," that if our camera people filmed inside an ossuary it must have been the broken one to which you refer. As it turns out no. 4 had the lid ajar, and that is how those pictures were produced. Either Rami or I were present for all the filming, which is required by our IAA license (directors have to be on the scene at all times) but I think I had gone into town for something the afternoon they took these shots. Anyway, we are making the corrections all around. Thanks for your comments, James. I have now updated this post by adding photographs and captions so that it is easier to follow for others. Just curious; how long were you filming and photographing at the tomb?